Lottery Random Numbers is a powerfull android application which is a real lottery numbers manager. I hope it can help you in winning money. By using it, you can generate random numbers for your country lottery. Unlike many others applications in the android market, Lottery random numbers suggests random numbers without special settings! On the first screen, you can see the lotteries of your country. If you want to play a paticular lottery from an other country, you can choose it by clicking on the top blue buttons. Many options are available in Lottery random numbers. - The most important one is that you can save your generated numbers (to check them later, to replay them the next time, etc). 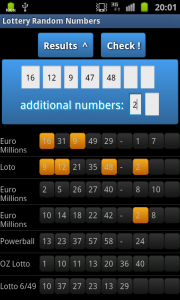 - On each lottery, you can generate or re-generate as many numbers as you want. 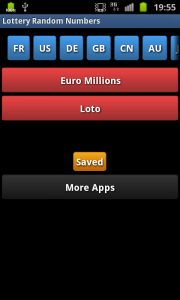 - On the saved screen; on can check your numbers to see if you have won the jackpot! - Since the version 1.4, you can send your generate numbers by mail or by SMS.. If you want me to add your favorite lottery, ask me in a commentary. Let me know what you think about my first application. To discover my other applications, go there. This entry was posted in Apps and tagged application, flash, generate, lottery random numbers, lotto, powerball, wakeupsun by WakeUp Sun. Bookmark the permalink.